Customers choose Uniworks for consistent high quality service, dependable communication and healthier cleaning options. Our Health-Focused Cleaning Program reduces the spread of illness-causing germs. The result is a healthier more productive works environment. Are you receiving the best value for your cleaning dollar? The impression of good service is easy to see, either the facility is visibly clean at first glance or it’s not. But value is in the unseen. It’s saving the customer money by using state-of-the-art equipment. It’s communicating issues or concerns. It’s knowing how to clean correctly and efficiently, killing germs and helping to keep employees healthy. ● Hospital-grade cleaning products to protect your facilities. 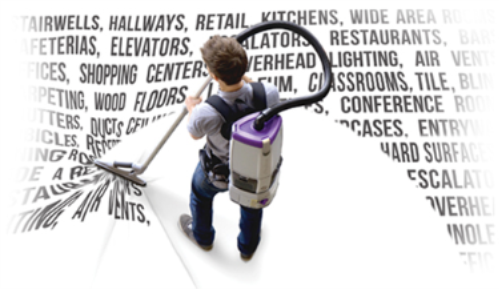 ● Backpack vacuums that exceed HEPA filtration standards for deep cleaning and enhanced indoor air quality. ● Color-coded microfiber cleaning cloths to stop the transfer of germs from bathrooms to desks and other areas. ● CleanCheck® web-based training system ensures a well-trained staff. ● CompuClean® Facility Management Software provides an integrated inspection system.